This post is part of a month long series called 'Pattern Makeover Month.' I took a simple a-line, peasant dress and 'made-it-over' into many different styles. For more information, go here. 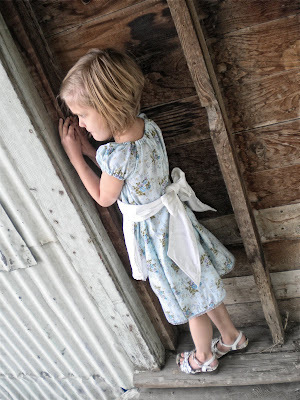 Vintage fabric from the thrift store and a beautifully embroidered tablerunner turned into a cutesy little apron dress. Make the dress as instructed, stopping when you finish sewing the casings on the neck and sleeves. If you want lace on the bottom, add it as you hem the dress. To make your apron, cut two strips measuring 60" long by 3-4" wide. For smaller sizes, you will want smaller widths. 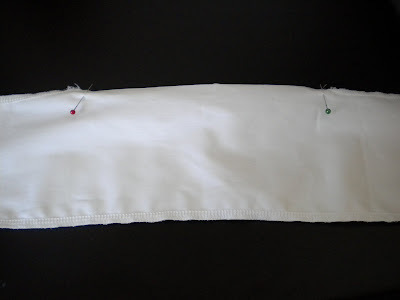 The sash will look better if you do not have seams, but if you don't want to use that much fabric, you can make seams right where the side seams will fit on your child. For example, if your child's chest measurement is 22", make the middle piece of your sash 11.5" and the two tails about 25". Cut the two ends of the sash at an angle. Place right sides together. 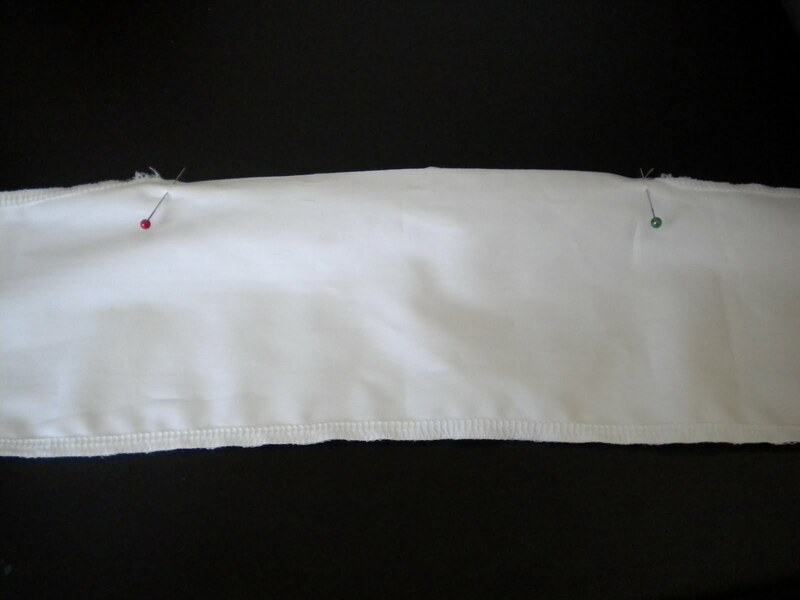 Find the midpoint of your sash and mark with pins 3.5" from the midpoint on both ends. Start sewing at one pin, going towards the tail. Sew all the way around, ending at the other pin. Turn right side out and press. Press the opening so that the unsewn edges are flush with the rest of the sash. For the apron piece, I used a vintage table runner. I didn't need to finish any of the sides, as it was already done (yippee!). I cut it to the length I wanted, gathered the top and fit it into my sash opening. Pin in place. Topstitch around the entire sash, sewing the apron into place. 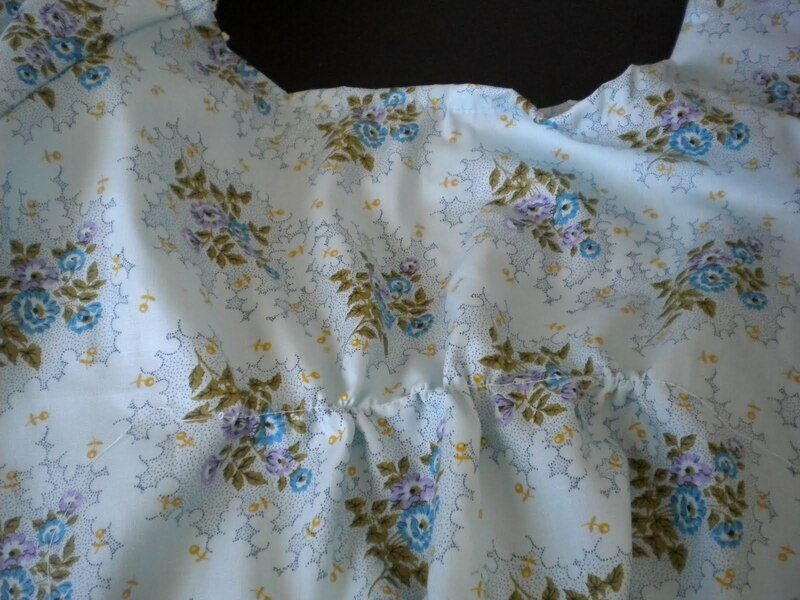 Then, to keep the apron in place, I stitched it onto the dress. First I put a slight gather on the dress where I wanted the apron to sit, about 3 inches below the underarm seam and 4 inches in from the side seams. Stitch across the dress and create a slight gather, matching it to the length of the apron piece. 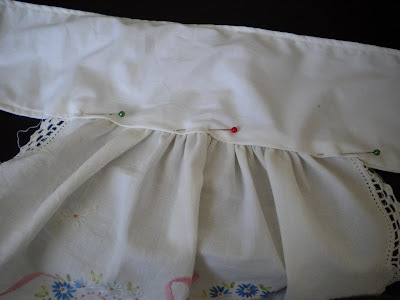 Stitch on top of your topstitching on the sash, where the apron piece sits onto the dress. Cute! You have such great ideas! Holy crap!!! So so cute!! Gorgeous! So are your other creations - I have just had my first peek and enjoyed looking at those as much as the name of your blog. We repurpose vintage fabric and doilies into bags -for young or old. They are listed on our Bessie website- www.vintageandretrobags.com. New to blogging, my latest on there has some of my recent finds- waiting for the sewing machine. Thanks for the ideas (loved that red doily from your previous post)! I love aprons on little girls dresses, so this is right up my alley! I love it!! And your daughter is a doll. The apron is gorgeous and I love using thrifted fabric - either sheets or old clothes! What a sweet dress and a darling model. Thanks for linking up to Saturday is Crafty Day @ along for the ride! Hope to see you back next week! What a fun outfit! I wish I could find such thrifty goodness where I live. I just came over from Craft Day at Along For the Ride. I saw the little thumbnail of this Angel posing and I just had to take another look. 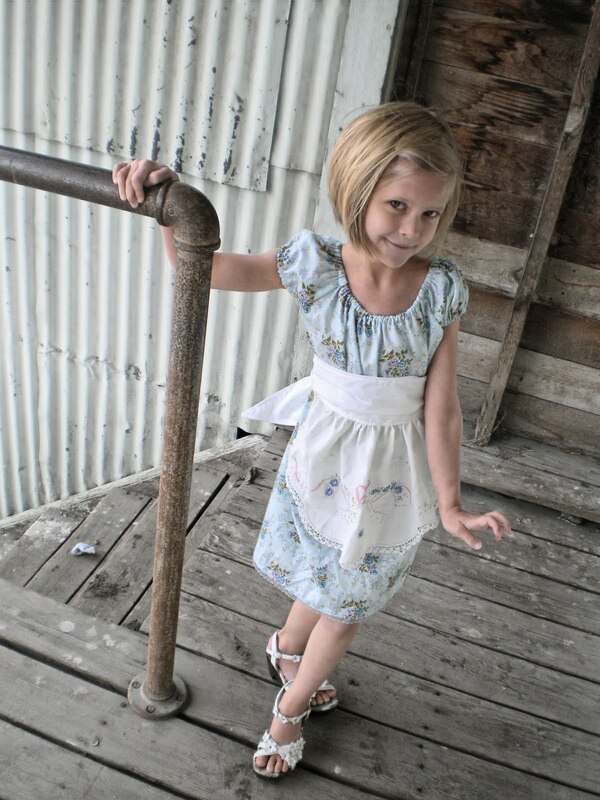 If she isn't the cutest thing ever, and that pose.. LOL she's a complete doll!The dress is gorgeous. Wonderful work and a wonderful model! SO CUTE!!! My girls would love this!!! Love this sweet apron and dress! I am so loving all your dresses this month!! All of these dress ideas are too too awesome. Loving it! Wow another cute dress!! She's a doll! Great dress! Thanks so much for sharing on Craft Schooling Sunday, it's so nice to "meet" a new face! Hope to see you again, all the best!